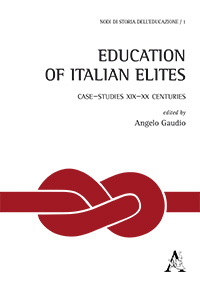 The education of Italian elites in the contemporary age is still far from a definite historiographical specific subject and overall focus is still under development. We have instead of a state of significant studies to other comparable domestic cases, such as the French one. This book aims to present some case studies that can offer materials for the construction of a history of the formation of the different Italian elites in time (from the early nineteenth century until 1945) and in space (Sicily, Pisa e Trieste).